I've gotten three sets so far. They say 60K mile tires, but I get around 44K. I've never been able to get anything close to any mile warranty for tires I've ever bought, so this doesn't bother me that much. Had purchased BF Goodrich tires some years ago and looking to buy a set again, soon. Great tire. I got 60,000 miles out of them. Bought my 06 Equinox LT used with these tires on them. They're just ok to me, a lot of vibration, extremely noisy, and hard as a rock. There is still a lot of tread, so I had them rotated and balanced and still no cure. Just a rough hard drive. The first set of tires on the Santa Fe got 111,000 miles before we got the second set. This set has gone for another 100,000 miles presently. Yes, I'd get another set. Bought these tires with 35,000 miles on a Nissan Murano...getting new tires at 90,000 miles...quite satisfied with the tire. The Long Trails I purchased are very good tires. Smooth riding tire especially on an older Dodge truck. Tire handles very well and is built very well. I'm very well satisfied with the tire and I would buy another set and spread the word to friends and family about the tire. 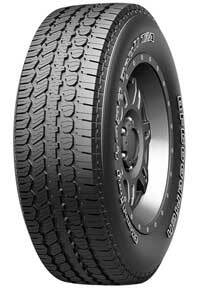 looking to buy 2 more BF Goodrich Long Trail T/A P245/70R17. I am shopping around now !!!!! I have had these tires on my CUV since it was bought. The 1st time I changed them was at 100,000 miles. I decided to change them with the same tire. Now at 195,000 miles of highway, light off road, and snow conditions for work, it is about time to change them again. For a 580AB tread wear tire they have well outlasted their suggested mileage. All goes to show quality. You get what you pay for! These tires lasted very well. It took about 3 years and 65,000-70,000 miles to kill and still have some life in them. Great tires. Got about 30,000 on them and no problems. These tires were great when they were new. After 50,000 miles, they feel unsafe in winter and wet traction. When I bought new, they were great but now they need to be replaced before 60,000 miles. The tread warranty is up. If I bought these again, I would not run them in winter. Please note that my vehicle was a 2001 Toyota Tacoma, not an Avalon. There was no option to select my vehicle. These tires were good the first year I got them, but they wore down very quickly and were useless in snow after that. I would not buy these again, mainly because I live in the mountains. 1st set of BFG LT T/A's (235/65R-17) were replaced under pro-rated warranty when they wore out after only 30K miles. 2nd set were down to half tread after only 20K and were suffering somewhat in the snow. Alignment and rotation were not the problem as I do maintain the car well. When I got a sidewall puncture (drywall screw) that couldn't be repaired, I took the opportunity to switch to another brand. OEM tires lasted 30K. I am very happy with my tire selection and purchase!! The price was great. These tires ride nice and quiet on my Explorer. Just had our first snow of the year and the tires were great in it. Great all around tire. Used on ice and it even had some grip then. Over 80,000 miles on the first set - I'm a fan! I've owned several sets of BF Goodrich tires over the years with great results. These are doing great so far and I'm sure will last for years to come. I highly recommend these tires. These tires worked great on my AWD Grand Cherokee. The AWD wears down tires rather quickly, especially with city driving. When gas prices started to rise, I drove the Jeep less in the city and more on the highway. I was able to get over 50k miles out of my first set of Long Trail T/A's - something that I cant say about my previous Bridgestone tires. Very Happy with BFG and I am on my 3rd set. 175,000 miles and going on my Jeep. Second set. Rides well in all weather conditions. Just bought these tires and they seem to be OK so far. Ride is a little rougher than my previous BF's. Price was good. They make me feel safe driving!! 2nd set I have owned. They have done a good job for me. I purchased these tires back in June '04. All I can say is these tires are GREAT! They handle and ride superbly. Currently (October '12), they have 80,000 mi on them. Had I not lifted my vehicle beyond the range of correctable camber, they would easily last another 15,000-20,000 mi. As they are, I can still put another 7,500 mi on them. After 8 years, I cannot say anything negative about these tires.